It's funny how by displaying your finished pieces of artwork around you in your studio, you become your own source of inspiration. Even accidental displays are fabulous to look at and just make you want to continue creating. That's my experience anyway. 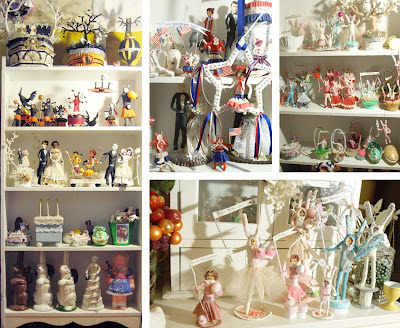 I have a shelf in my studio where I store my most recently completed creations. I usually don't arrange them in any particular order, I just stick them wherever there's room and it "magically" forms a little display that always changes as I sell items and continue to make new pieces. When I'm on a creative roll, I tend to let things pile up before I place them online for sale. When that happens, my shelf overflows and I start placing the finished pieces on any available surface, thus creating even more displays around the studio. Then I sell off the pieces and start all over again. I love it!